It's time to hit the beach! From Kourtney Kardashian to Naya Rivera, here are our favorite sizzling-hot pregnant celebrity mamas showing off their bikini bump. There are few things more adorable than sun kissed bump buddies rocking bandeau-style bikinis together. Bar Refaeli took to Instagram to post the pic she snapped with her friend, and gave it a caption that read, "Double trouble." We will take her word for it—plus, those fedoras on tilt clearly show these preggos mean business. Erika Christensen bares her bump during a hike at Koko Head Regional Park in Oahu, Hawaii, and shares an image of the moment to her Instagram feed. She addresses planet earth and captions her gram, "Thank you for your endless beauty and natural adventures! Thank you for your resilience in the face of our abuse. Many of us are trying to help protect you. Even just by picking up trash on a hike! Let's face it, every day is Earth Day." Now that's some real bikini bump inspiration! Who needs a yellow polka dot bikini when you can be Bar Refaeli? Seriously though, this sunbathing beauty is leisurely soaking up the rays and loving it! She's sporting a fedora-style hat with a mossy green bow in her Instagram post, captioned, "Caught in action." Well, it doesn't look like much action is happening, Refaeli, but we'll let it slide if you keep the cute bump pics coming! Former Bachelor contestant, Catherine Giudici Lowe, shared a photo of her golden bump on Instagram with a caption that read, "Bikini Body by Baby." We totally get the humor! Lowe and her hubby, Sean Lowe (the Bachelor she snagged), are thrilled to be expecting their first child—and we're thrilled to live through her feel-good Palm Springs babymoon moments. Keep 'em coming! Jaime King bared (almost) all for her fans on Instagram with this shot of her in nothing more than white bikini bottoms, a fedora hat and sunglasses. The 36-year-old actress is not one to be shy about her pregnancies—this time with baby number two—and she's clearly not about to start now! Kristin Cavallari took to Instagram to show off her baby belly poolside while attending a friend's bachelorette party in Ojai, Calif. She sported an itty bitty black bikini top and white bottoms under the shade of a chic brown fedora hat. The 28-year-old announced her latest pregnancy with husband and Chicago Bears quarterback Jay Cutler in May. The two are already parents to 13-month-old Jaxon Wyatt and two-and-a-half-year-old Camden Jack. Naya Rivera, star of Glee and Devious Maids, showed off her bump in a teeny neutral bikini while wading in the waves on her April babymoon with husband Ryan Dorsey. Kourtney Kardashian shimmers in a gold bikini while debuting her pregnancy with baby Reign Aston last year. Hilaria Baldwin poses poolside in a strapless bikini with her babies—first born Carmen and her baby-to-be bump. Vanessa Lachey poses by crashing waves in a patterned one-piece while pregnant with daughter Brooklyn Elizabeth, born in January. Her other child with Nick Lachey, son Camden, is 2. Molly Sims posed for this shot, captioned "Sports Illustrated Swimsuit Preggers Edition" in Bahamas when 7 months pregnant with newborn daughter Scarlett May. 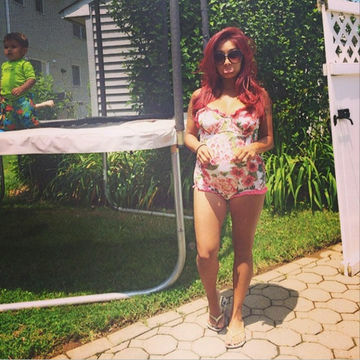 Snooki complained that the belt from her adorable floral one-piece didn't buckle "over the baby girl" when she posed for this pic while pregnant with daughter Giovanna Marie, born in September. Her first child with fiancé Jionni LaValle, son Lorenzo Dominic LaValle, is 2. Stacy Keibler was one happy mama to be posing with her bump last Mother's Day. The former wrestler looked positively glowing in a crocheted cropped tank and white bikini. She'll be celebrating in earnest this year with new daughter Ava Grace. Jessica Simpson was bumpin' and proud in this bikini selfie during her pregnancy with second son Ace. Audrina Patridge wondered if her tiny bump was from a "burrito or baby" when she debuted her newly pregnant bikini-clad body just a month after announcing she was pregnant. The Hills star put her toned and tan bod on display in a classic mis-matched suit, with a flattering black string top and nautical striped bottoms.